I would like to express my sincere thanks to the Government of China for inviting me to witness the destruction of 662 kg of confiscated elephant ivory today and I regret that I am unable to make it to Beijing in person. This is the third public destruction of confiscated elephant ivory in China since January 2014. It follows the crushing of 6.2 tonnes of seized ivory in Dongguan and the incineration of 28 tonnes in Hong Kong SAR. Over the past 24 months we have also seen Belgium, Chad, the Republic of Congo, Ethiopia, France, Gabon, Kenya, the Philippines, the United Arab Emirates and the United States, all destroy stockpiles of illegally traded elephant ivory that has been seized and confiscated. Today’s important event in China’s capital city, Beijing, serves to raise further public awareness about the impacts of illegal trade in elephant ivory and the ongoing determination of China and the global community to put an end to it. Despite considerable efforts to combat wildlife crime, it continues to be a major problem worldwide. The poaching of African elephants and the illegal trade in their ivory continues to be driven by transnational organized criminals and, in some cases, rebel militia at an industrial scale and it is one of the most destructive forms of wildlife crime. It is not only having a devastating impact on the African elephant, but also poses a threat to people and their livelihoods – as well as national economies and in some cases national and regional security. It must stop and the international community is demonstrating an increasing determination to end this illicit trade. Distinguished guests, the destruction of confiscated elephant ivory in Beijing today will not in itself put an end to the illegal trade in elephant ivory. It is, however, ensuring that no one will ever profit from this contraband and, when coupled with the seizure of ivory and the prosecution and conviction of offenders, it sends a powerful message that China does not and will not tolerate this illegal trade. The enhanced collective effort that is underway to combat illegal trade in wildlife – both at international and national level – is a clear evidence that illegal trade in elephant ivory is increasingly being recognized by States as a serious crime, which now carries a much higher risk of detection, prosecution and conviction in a growing number of countries – with higher penalties, including fines, imprisonment and the confiscation of assets being imposed. China’s laws carry a maximum sentence of life imprisonment for illegal trade in wildlife and we are seeing increasing levels of prosecutions and convictions. Today’s event provides a very public opportunity to warn those people who trade illegally in elephant ivory that the age and origin of their contraband can now be readily identified through the use of modern forensics making prosecution and conviction much more likely. Further, the availability of modern forensics means that whatever may happen in the future, illegally traded elephant ivory will never have any commercial value and the return on the ‘investment’ will most likely be imprisonment, heavy fines, and seized assets. 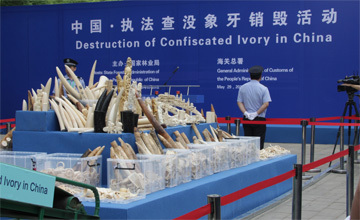 We are most encouraged that the measures being taken by China to combat this highly destructive illegal trade are designed not only to further strengthen its enforcement efforts domestically, but also to improve its collaboration with elephant range States, as well as with transit and other destination countries, to stop the illegal trade in elephant ivory and other wildlife. Distinguished guests, what was recognized at the 16th meeting of the Conference of the Parties to CITES in Bangkok in 2013 is even more relevant today: reversing the disturbing trends in elephant poaching and ivory smuggling requires a sustained and collective international effort. Today’s event will attract global, regional and national attention and should serve to raise further public awareness about the devastating impacts of illegal trade in elephant ivory trade and other forms of wildlife trafficking, and about the global community’s collective determination to put an end to it. The Secretary-General does not encourage or discourage countries (as States Parties to CITES) to choose one option or the other. This is a matter for each country to determine for itself. 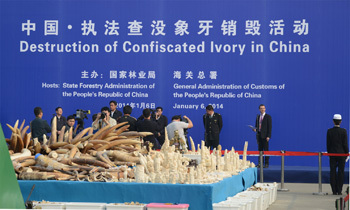 However, when a country, such as China, takes a decision to publicly destroy its confiscated stockpiles of elephant ivory, the Secretary-General regards it as presenting a unique opportunity to draw public attention to the scale, nature and impacts of the serious crimes that lie behind these confiscations and to act as a deterrent to illegal trade.